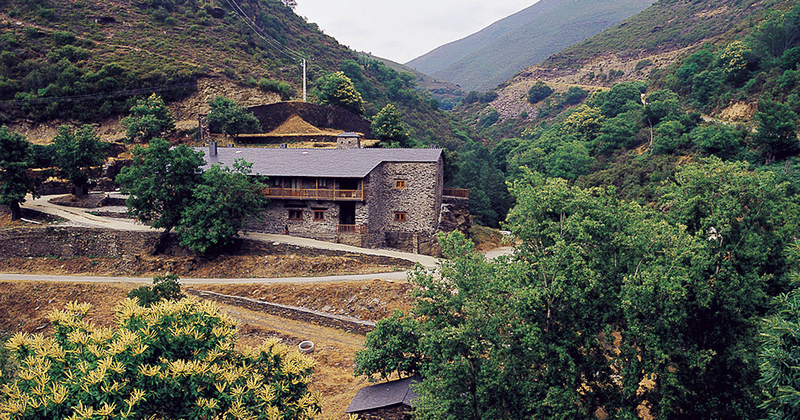 Quiroga is a special territory for those who enjoy the interior of Galicia. The municipality is halfway between two of the most beautiful areas in the country: the Ribeira Sacra and O Courel. Thus, it shares the fluvial canyons landscapes typical of the former, mainly around the ubiquitous Lor River (famous for the gastronomic excellence of its trout); and opens the doors to the mountainous and rugged terrain of the latter. The route we propose today, by the banks of the Soldón River, perfectly reflects the passage between these two geographies. The Soldón is a small river, but a tough one. It comes down from O Courel carving its way by the foot of the mountain, jumping from rock to rock and dodging dark green vegetation. It does so with great force over winter and spring, because the height difference that it clears between its birth, at 1,160 meters, and its end at the mouth of the Sil is more than considerable. It’s for this reason that it is convenient to consider doing this route in the same direction as the waters of Soldón. The route starts a little past the Ferrería de Rugando, an old industrial building converted into a rural tourism house. The forge was established by the Samos monks around the sixteenth century, although at present there are hardly any traces of the factory left and what remains are the old houses (with a spectacular chimney presiding over the building) and the chapel (on which façade intriguing circular decorations are still preserved). Taking the route in a downward direction will not save us from suffering through a couple of hard slopes, as the path goes up and down along the river, and there are some difficult climbs for those who are not used to hiking. In wet weather one must be careful where they step: the ground is often bare slate and can be slippery. The route is known as Camiño do Ferradal (“path of the iron mine”) and uses the path of an old road through which minerals were brought down from the mountains. Going through it shows how difficult this task must have been with the means of transport available a century ago, but also the beauty of a forest barely transformed by the years. A good part of the way passes under forests where still today chestnuts, among the tastiest in Galicia, are collected. Oak trees, ash trees and other species typical of the Galician mountains surround the track, a hike that always keeps the Soldón in sight, along with its fierce roar. Several wooden bridges cross the creeks that flow into the main stream (be very careful when the wooden floor is wet! ), and from time to time you can see old sequeiros (chestnut dryers) and alvarizas (traditional constructions used to protect beehives, which produce some excellent honey here, from bad weather). The Camiño do Ferradal links Rugando, Paradapiñol, Paradaseca and Ponte Soldón, and in any of these villages one can find a connection to the main road, on the other side of the river, in case you run out of strength or time runs inadvertently fast in a place where one can be awed by the natural beauty of Galicia.